BioWeekSF will soon be here again — January 5-10, 2019 — the week of the J.P. Morgan Healthcare Conference and 20 other events and forums. In preparation, the week’s premium online guide, BioWeekSF.com, is showcasing a series of reports and other resources focusing on financing and dealmaking. This feature is from DealForma, the biopharma database providing you comprehensive information and analyst support hours to help you be more confident using quality data in your business development research. 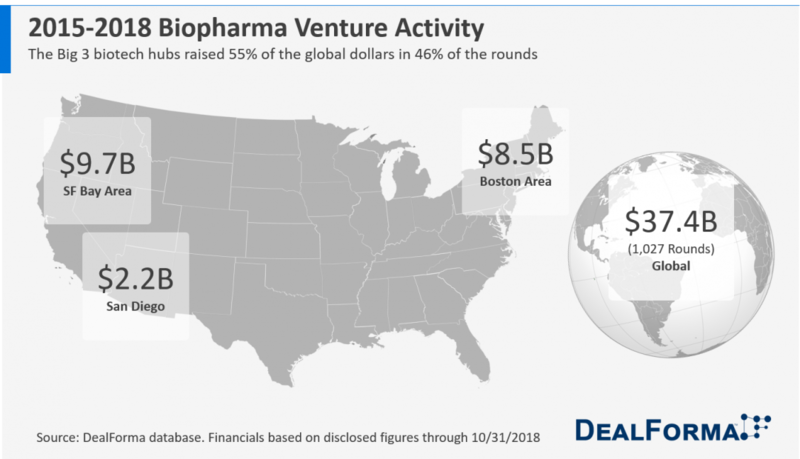 “Data for the this analysis was compiled using the DealForma database; specifically the companies and venture funding sections. We used company location data tagged with the three major U.S. biotech hubs along with primary therapeutic and technology focus areas. All data are based on publicly disclosed figures. We invite you to answer interesting questions using our data and carefully curated profiles on deals, pipelines, companies, funding, and business executives by visiting dealforma.com to schedule your personalized demo.